When Em finds the cryptic scribblings hidden in the drain of her cell, she knows she's been there before... Or at least another version of herself. Only Finn in the next cell is keeping her sane, and her only bargaining plea is the documents guaranteeing their lives, from the doctor and the director within the government facility in which they're being held. The present is a war ravaged land, with countries on the attack throughout the world and entire states wiped off the map. If you had the chance to travel back to destroy the cause of the death and desolation... Would you? With help on the inside, Em and Finn escape, making it back to Cassandra, the underground subatomic particle collider that will send them back four years earlier... When the full conception of travel in the fourth dimension is realised, time travel. Childhood friends Marina and James are best friends, next door neighbours and if Marina is correct, soul mates with Finn completing the unlikely trio. But when tragedy strikes James's life, again, it sets events into motion that no one could have predicted. James is not only gifted, he's a genius. Gone is the shy, awkward teen boy, he's an intellect, handsome and wealthy, his brother is a congressman and James is determined to make the world a better place. But someone wants James dead, he's being hunted and there is nothing that Marina won't do to ensure James is protected. Em and the slightly older, future Finn need to stop Cassandra being built.... Again. The two have traveled back fourteen times prior, only to discover they've been unable to alter the outcome. The new world is a very different place, American drone planes attacking China, Israel involved in a nuclear standoff against Syria. Marines with machine guns on street corners, the Californian air raids, the government monitoring phone calls and internet usage, waiting for a keyword that will have you tried and convicted as a terrorist. Time travel should never have been capable, if Em fails again, she'll be taken back to her cell and tortured by The Doctor, over the whereabouts of her only insurance policy... And then power hungry, insane totalitarian government will destroy what little humanity remains. 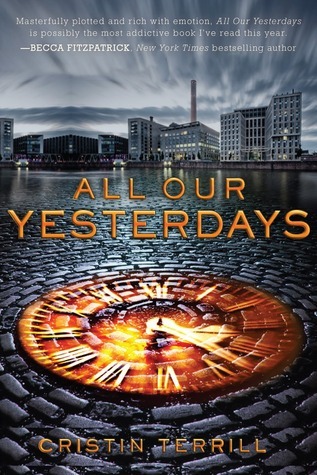 All Our Yesterdays was difficult to review, without giving away the stunning and shocking plot twists. It's young adult, but the intelligence behind the storyline will leave even adults breathless. More science fiction than fantasy, the time travel aspect is well thought out and like most that dabble with the subject, it isn't confusing and won't leave you with boring and lengthy descriptions either. I really enjoyed it. It's an emotional ride, but more often than not, will leave you on the edge of your seat. The characters are brilliant and it blurs the lines between heroes and villains. Prepare yourself for a gut wrenching ending that you won't see coming. You'll be left utterly exhausted.